Donnelly River covers a fair size area of hte South West region of Western Australia. Nearby a former timber-mill town it is now a heritage holiday destination. 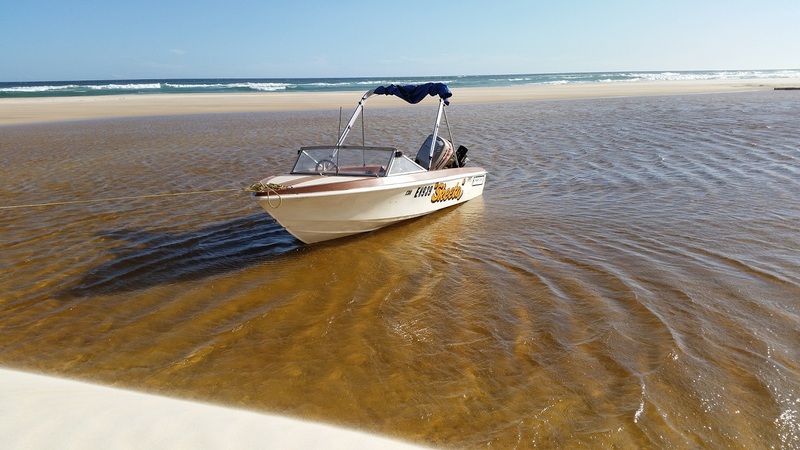 The access point to the Donnelly River boat ramp is about 300 kms from Perth and 50kms beyond Nannup, towards Pemberton in the D’Entrecasteaux National Park. The Donnelly River flows into the Southern Ocean. So it’s the lead up to Easter 2015 and I’m wondering what exciting adventure can be had with minimal planning and short lead time. I built a fibreglass kayak 40 years ago in my teen years. 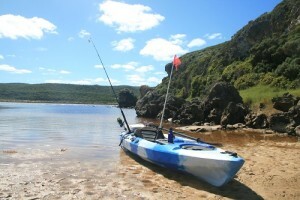 I remember how wonderful it was to paddle about the Queanbeyan River in NSW and Cooma area. in the late 1970s I purchased a Canadian canoe to paddle the massive flood waters running through Leonora, WA. However, that is a long time ago! 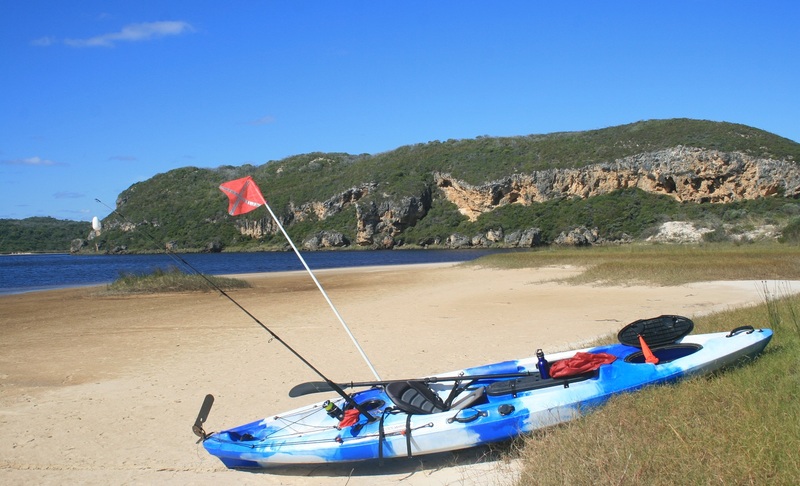 Looking around on GumTree I saw a kayak for sale, less than 12 months old for a very reasonable price. In fact about 1/3 of new price. So I then began looking for rivers in the South West that I could go for a ‘paddle’. The Donnelly River looked like a perfect match. A 24 kilometre round trip from the boat landing at Carey Brook to the Southern Ocean. So I purchased the kayak, which was all ready to go with carbon fibre paddle, deluxe padded seat and waterproof stowage ports. I packed up the yak with everything for an overnight trip. Keeping things to bare minimum, 3 x 1.5 litres of bottled water, sleeping bag, light weight single tent, and a propane bushwalking stove. Also my headlamp, waterproofs, a light fishing rod, tackle box, food and of course a small bottle of Scotch. I’m certainly not the fittest specimen these days. 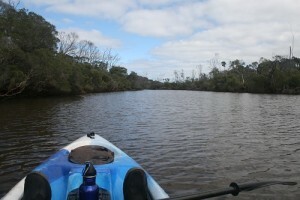 As I headed out from the landing I wondered about paddling 12 kms, and the return trip. From the boat landing the river is quite narrow and many trees have fallen into the river (I suspect bank erosion from power craft contribute to this). There are very few places along the river you can pull into as the bush and trees crowd the river edge. 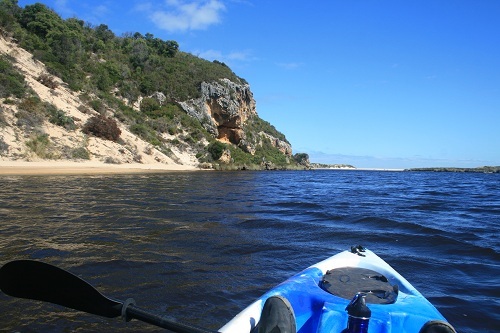 A small sandy bank a few kilometres down is one spot (stopped there on the way back) but otherwise the paddle is all the way! I camped on the mouth and had the whole place to myself. How often can you do that on an Easter weekend! 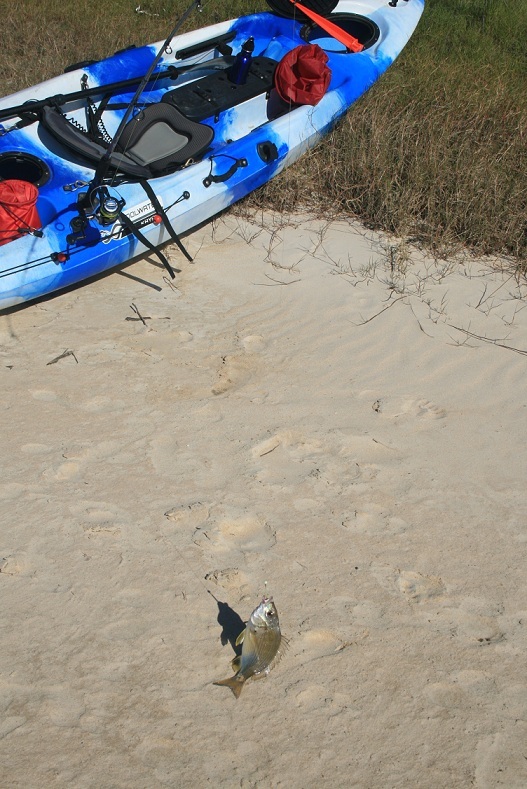 One small bream was all I caught but did watch guys pull in several salmon from the beach. I’ll be back. 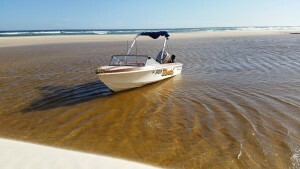 Well I did return a few weeks later, this time in my 16foot run-about. 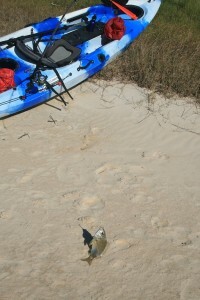 Camped on the beach again but his time had my surf rod and caught two good sized salmon. I filleted them on the beach and packed them in ice ready for the trip home. 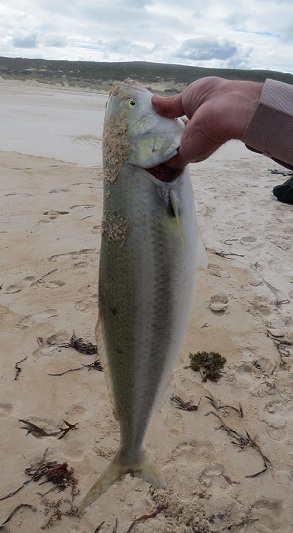 A good few kilos of meat out of two fish and the biggest thrill I’ve ever had beach fishing. On arriving home I made a fish curry and it was fantastic. Looking forward to catching and eating some more.